Watch the rockers give the Concrete And Gold track its live debut. 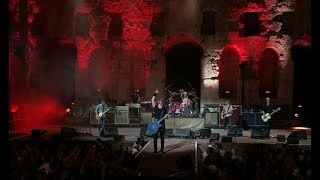 Playing Greece's ancient theatre of Herodes Atticus under the Acropolis, the Learn To Fly rockers played new track Arrows, which is believed to be taken from their forthcoming Concrete and Gold album. Watch it here above courtesy of Roxx gr. Arrows is the latest new song to be shared by the band, following the likes of The Sky Is A Neighborhood in San Francisco and Dirty Water In Paris. The track was park of a 20-song set, which much like their Glastonbury set included much-loved hits such as Times Like These, These Days, Best Of You and Everlong. Dave Grohl opened their epic set on the Pyramid Stage last month, by paying tribute to Florence + The Machine, who filled in for them after he broke his leg in 2015. As Dave Grohl walked onto the Pyramid Stage alone, he told the crowd: “For all of you who were here in 2015, I’m sorry I missed you. But I watched that show on my laptop and it looked beautiful. The band also dedicated their anthemic Everlong track to their late fan Laura Plane, keeping true to his word to her widower Jon.